Rama Navami is the festival that marks the advent of the Lord as Rama. Many years, the festival occurs when Swami is in Kodai. On such occasions, the festival becomes a truly memorable day for the boys. On one such Rama Navami day, Swami materialised the pearl necklace that Sita gifted to Hanuman at the time of Rama's Coronation. Rama was distributing various gifts to members in the assembly but somehow, He seemed to skip Hanuman. Sita was troubled by this apparent indifference; how could such a loyal one like Hanuman be overlooked on an occasion like this? So, she whispered to Rama that Hanuman should not be forgotten. Rama whispered back that Hanuman was way above material gifts. Sita was not quite satisfied by this reply; so she took out a pearl necklace that she was wearing and offered it to Hanuman. While receiving the necklace, Hanuman gave it a suspicious look. He then placed the necklace near one of his ears as if to check whether the individual pearls were emitting some sound. He appeared to examine every pearl in the necklace, and once in a while, he would bite a pearl. Sita was shocked by this behaviour. Was Hanuman proving that, after all, he was a monkey? She demanded an explanation from Hanuman for what he was doing. With great humility Hanuman replied, "Mother, for me the Name of Rama is supreme. An object is worthless if it does not resound with the Name of Rama. Some of these pearls are not emitting the proper sound and so I am chewing them up." Sita was neither convinced nor amused and tersely remarked, "Pearls do not emit sound." Hanuman replied, "Everything that is saturated with the Rama Principle will always chant the Name of Rama. Let me demonstrate." So saying, Hanuman plucked a hair from his body and offered it to Rama. When Sita took it near her ear, she could clearly hear the chant of Rama's Name! This was the way Hanuman proved to the world how intense true devotion really is. 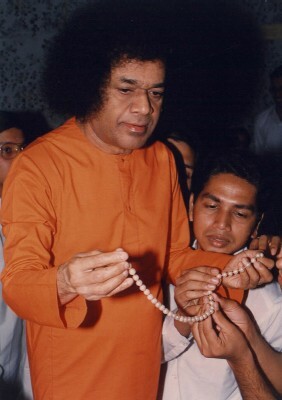 After narrating the story and materialising the necklace, Swami passed it around and asked the boys to carefully examine it. Sure enough many pearls had teeth marks! After everyone present there had had a look, Swami made the necklace disappear!